The importance of good indoor air was the focus in the modernisation of the Ministry of Economic Affairs and Employment’s premises. Located in Aleksanterinkatu 4-10 in Helsinki, the activity-based environment was created in a valuable property that is more than 200 years old. 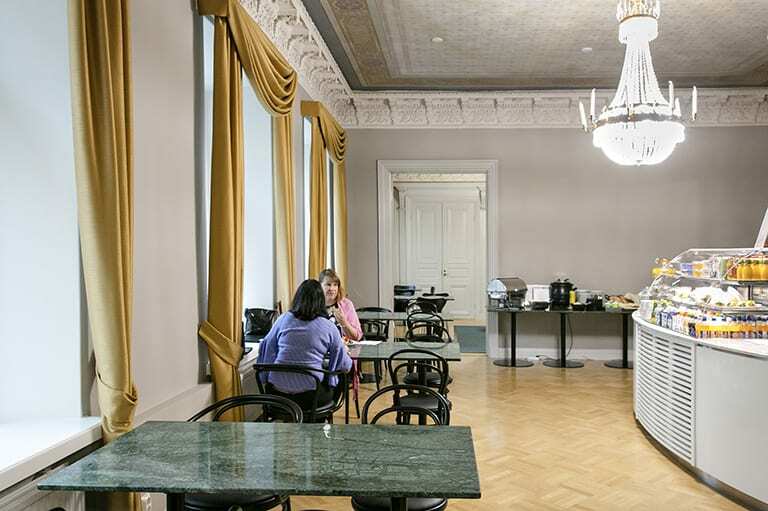 The historic and valuable building of the Ministry of Economic Affairs and Employment (TEM) in the very centre of Helsinki in Aleksanterinkatu 4-10 was modernised under the management of Senate Properties into a modern, comfortable and safe activity-based environment. The Ministry’s staff moved into the new premises in October 2018. Located next to the Presidential Palace, the neoclassical Empire building was designed and completed in the 19th century and it is protected by the Finnish Heritage Agency. The modernisation, which began in 2015, has been the most extensive modernisation project in the building’s history. The project’s budget was approximately EUR 21 million and its was carried out in two stages. The project focused on good indoor air and the security solutions needed by the Ministry. Mika Kankainen, Account Manager at Senate Properties, says that TEM’s activity-based environment was first discussed in 2009. At the time, Senate and the Ministry began analysing the Ministry’s needs and discussed what would be the best office concept for the Ministry. TEM’s staff were then working in four different locations and the goal of its workplace improvement project was to place everyone in two buildings that would be modernised: Eteläesplanadi 4 and Aleksanterinkatu 4–10. According to the concept, two thirds of the staff would have personal workstations in an activity-based environment and a third would have their own rooms. The modernisation project in Eteläesplanadi was completed in 2015 and at the same time work started in Aleksanterinkatu 4–10 on the first stage. 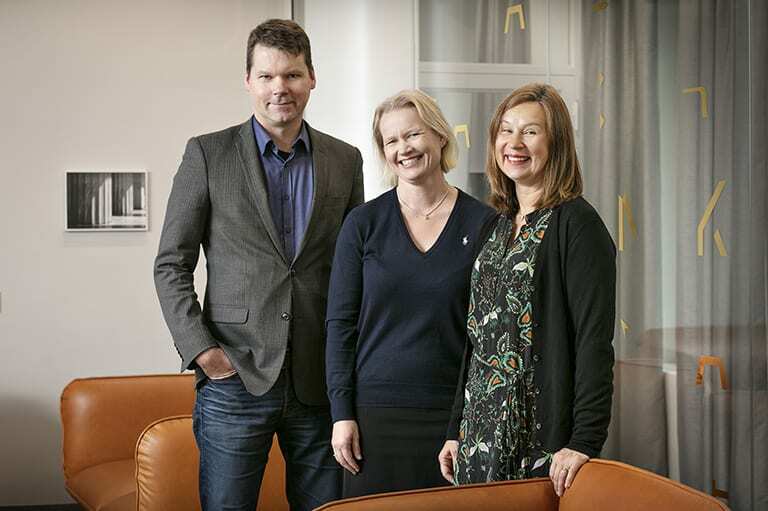 Mika Kankainen, Account Manager at Senate, Heidi Nummela, TEM’s Director of HR and Administration, and Aino Jalonen, Director of Division at the Prime Minister’s Office are satisfied with the new, stylish and secure premises in Aleksanterinkatu 4–10. The plan needed soma adjusting along the way, however. One factor was that when the original workplace concept was completed in 2010, there were 650 employees at the Ministry while now there are 400. According to Kankainen, tools, ways of working and the understanding of what an activity-based environment is has also changed radically over the years. The first stage in the modernisation of Aleksanterinkatu 4-10 was carried out in 2015-2017 and the modernisation of the second half was completed in autumn 2018. During this time TEM’s personnel worked in Eteläesplanadi and in Aleksanterinkatu on the side of the building that was not a construction site. 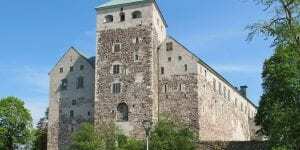 “The modernisation was carried out in good collaboration with the Finnish Heritage Agency. We share a goal: to provide the Ministry with modern premises of a high standard but respecting the historic building,” says Aino Jalonen, Director of Division at the Prime Minister’s Office. The building, which is owned by Senate, was renovated 30 years ago and in the new project traces of the work completed in the 1980s were left visible. 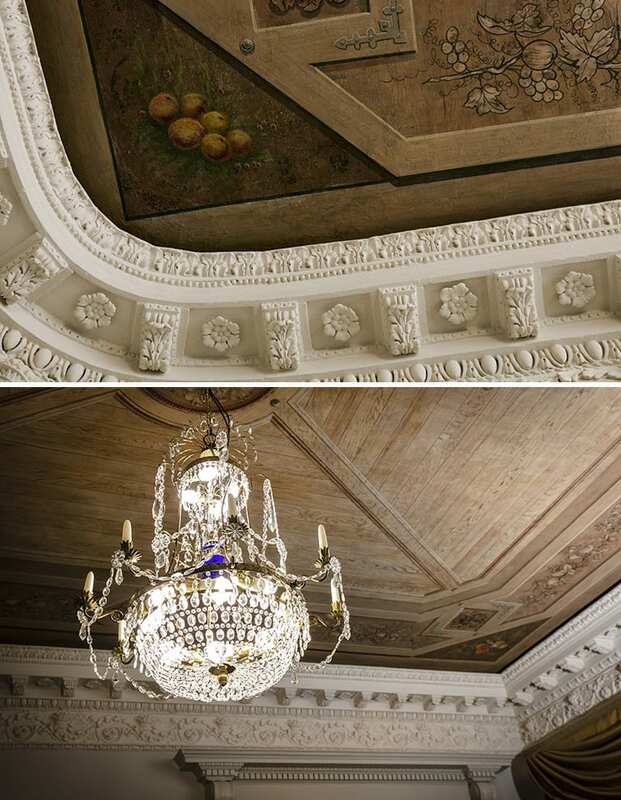 The restored paintings on the ceilings and ornaments of the rooms on the Aleksanterinkatu side are testament to the skill of 19th century craftsmen (Picture above). The old chandeliers were cleaned and repaired to their former glory (Picture below). According to Jalonen, most of the premises used by ministries in the centre of Helsinki are protected historic buildings and architecturally important and unique. The same things are repeated in all modernisation projects, however, including the new activity-based concept. Jalonen says that the goal was also to display the splendour of the historic building for every employee to see and experience. The most magnificent rooms are on the Aleksanterinkatu side and they were carefully conserved. The staff lunch café can be found in the building’s most magnificent room. According to Aino Jalonen, Director of Division, one of the parties involved in the change that took place at TEM was the Government Administration Department founded in 2015. It is in charge of all matters related to ministries’ premises. On the left of the entrance lobby is a hub space intended for everyone, where visitors to the conference centre in Aleksanterinkatu can sit down for a moment to relax or work between meetings. After a brief period of familiarisation with the new offices, the personnel of the Ministry of Economic Affairs and Employment have settled in very well. Heidi Nummela, TEM’s Director of HR and Administration, says that employees have been more satisfied than she would have dared to expect. 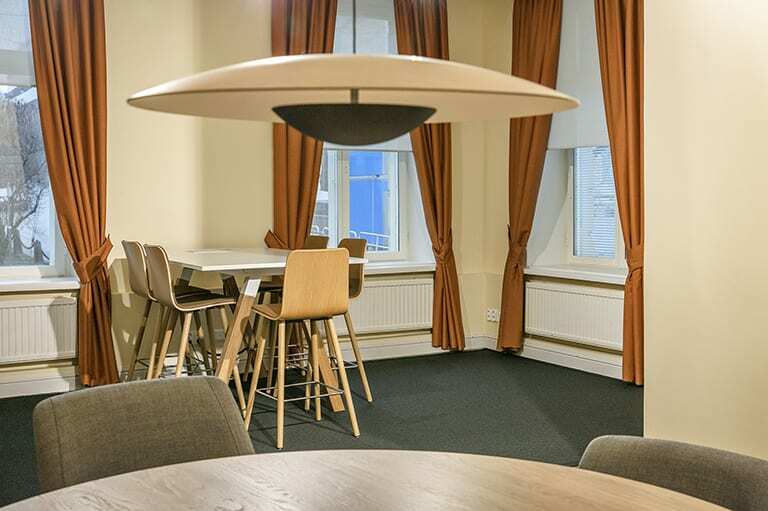 In fact, the clean indoor air plays a big role in the offices in Aleksanterinkatu: during the modernisation project, the budget increased from EUR 14 to 21 million, mainly because a decision was made to thoroughly clean the intermediate floor of the old building. According to Mika Kankainen from Senate, ensuring a high quality of indoor air was one of the most important goals from the beginning. “The three air-conditioning rooms in the attic were expanded and a new one was added to make enough space for modern ventilation technology. Our original idea was to keep the intermediate floors because there was no indication of indoor air issues in the building. To ensure good indoor air, it was important to remove the various insulation materials, such as marine sand, building waste and moss,” Kankainen says. Heidi Nummela believes that the fact that many had a chance to work in the activity-based environment in Eteläesplanadi played a role in the personnel’s quick adaptation. In addition, Senate, the Prime Minister’s Office and the Ministry supported the personnel with workshops and openly informing people of the progress of the modernisation. “We also tried something completely new: we founded a removal mentor team in the HR unit with a mentor from every department to prepare for the removal. We listened and chatted about the worries, concerns and questions people had about the change. The removal mentors are important messengers for their departments,” Nummela says. According to Nummela, TEM’s personnel appreciate the grand surroundings and new, activity-based premises. “There is room for improvement, of course. For instance, a large conference room is needed. That is not a critical problem, fortunately, because only a hundred metres away there is a government conference centre on Mariankatu that we can use.” (Picture above). Each employee has their own locker in the activity-based environment. Attention has also been given to other storage space – most of the personnel are women and space is needed for high boots, for instance (Picture below). Aino Jalonen praises the removal mentor model and says it was the most participatory process ever organised in any ministry’s change-over to an activity-based environment. Heidi Nummela says that it was the most mundane things that people were most worried about in advance, such as whether there would be enough toilets and space for belongings and overcoats. Some people were also worried about being able to concentrate in shared spaces and that there would be too much noise in the offices. Heidi Nummela and Mika Kankainen point out that the TEM is also the “Ministry of Energy”: relative energy consumption has fallen by about 70 per cent per person thanks to building engineering improvements and, in particular, the increased efficiency in the use of space. “Leasing costs also decreased significantly when we moved to the same address,” says Nummela. Nummela says that TEM’s personnel have been especially satisfied with the increase in social interaction. The neoclassical building of the Ministry of Economic Affairs and Employment consists of four houses built for the most powerful merchants in the 19th century. Located in the heart of Helsinki, the most famous of them is the Empire-style building designed by C.L. Engel for the merchant Eric Borgström, completed in 1826. Over the years, the buildings have housed a hotel, named Hotel De Russie, and the country’s first state-run girls’ school, Svenska Fruntimmerskolan. At the beginning of the 20th century, the government took over the ownership and the buildings were given to various agencies, including the provincial government for many years. The buildings in Aleksanterinkatu 6-10 were combined into a single building in 1915-19 and in the 1930s a building on the Mariankatu side, designed by Engel, was combined with the others. Today, the building which spans half a block is owned by Senate Properties.